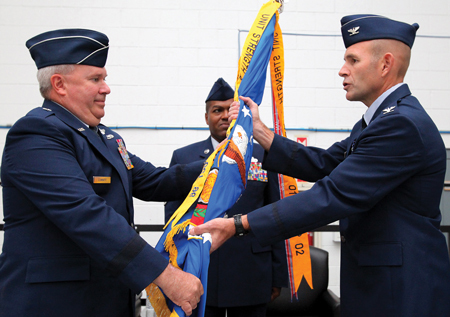 Incoming New Jersey Air National Guard commander Col. Robert C. Bolton, right, is presented the NJANG guidon by Brig. Gen. Michael L. Cunniff, left, The Adjutant General of New Jersey, as State Command Chief Master Sgt. Vincent Morton observes during the Change of Command ceremony held at the Joint Training and Training Development Center Sept. 15, 2012. 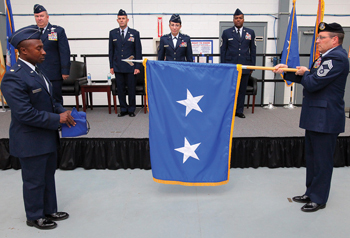 Col. Robert C. Bolton assumed command of the New Jersey Air National Guard at the Joint Training and Training Development Center, Sept. 15. "What I ask of all of you is to do your current mission well but keep an open mind," said Bolton. "Continue what you've done for years: safely and effectively perform your mission with outstanding professionalism." Bolton will command the state's Air Guard, which has more than 2,000 Airmen and includes the 108th Wing and the 177th Fighter Wing. The new commander has a firm grasp of what his new duties will be: To provide mission ready Citizen-Airmen, aircraft, and equipment to both federal and state leadership in support of taskings across all spectrums. "My job will be to ensure the Wings' have what they need to meet that mission and to ensure we can provide whatever support is requested of us by both the Federal and State governments." Bolton assumed command of the NJANG from Maj. Gen. Maria A. Falca- Dodson, the first female to be promoted to the rank of major general in the New Jersey National Guard and also the first woman to hold the position of assistant adjutant general for the air component. "The future is bright for the New Jersey Air National Guard and I am truly honored and blessed to have this position," Bolton said. "I look forward with excitement to the challenges ahead." Maj. Devon Hanson, left, and Chief Master Sgt. Thomas Fahnstock, right, furl the flag of outgoing New Jersey Air National Guard commander Maj. Gen. Maria A. Falca-Dodson, back row, second from right, while Brig. Gen. Michael L. Cunniff, back row left, The Adjutant General of New Jersey; incoming NJANG commander Col. Robert C. Bolton, back row second from left and State Command Chief Master Sgt. Vincent Morton observe. His military career began when he received a four-year Air Force Reserve Officer Training Corps engineering scholarship and attended the University of Massachusetts, Amherst. He was commissioned in May 1983 and began undergraduate pilot training in July 1983. After completing pilot training as a distinguished graduate, Bolton spent the next six years flying as both an F-15 Eagle and as instructor pilot. In 1990, Bolton joined the 177th Fighter Wing as an F-16 Fighting Falcon instructor pilot. In addition, he served as the Chief of Training, Weapons, and Scheduling. In the ensuing years, he served in a variety of command positions and when the events of September 11, 2001 unfolded, Bolton became the unit's Alert Operations and Scheduling officer and flew on many of the Combat Air Patrol missions. From 2003 through 2006 he served as the Wing's Alert Detachment Commander. In 2006, he deployed in support of Operation Iraqi Freedom. The following year, he was appointed as the Operations Group Commander and in 2009 he was selected as the Wing Commander. In March 2012, Bolton became the Deputy Commander of the New Jersey Air National Guard.